STAFFusion « Flexible. Vetted. Staffing. FAST! 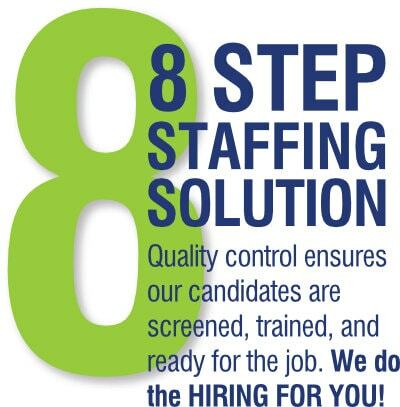 OUR 8 STEP STAFFING SOLUTION BEGINS WITH US ACTIVELY LISTENING AND UNDERSTANDING YOUR NEEDS, THOROUGHLY VETTING CANDIDATES, AND ASSISTING CLIENTS BY ADDRESSING AND OVERCOMING CHALLENGES IN A THRIVING ECONOMIC CLIMATE. TEAM STAFFUSION IS THE BEST! Fortune 500’s, MSP’s, and Businesses partner with STAFFusion to reduce employee turnover, quick fill high-volume staffing requests, and scale with their business needs. We excel at support, technical, manufacturing, and management placements. Our internal scorecard keeps Team STAFFusion focused on transparent, ethical business practices while performing at a high level of productivity. We select the best candidates and effectively engage and reward metrics. Safety is a high priority, monitored through our Certified Safety Committee. We secure candidate selection with a placement guarantee and bundle into one comprehensive price. Copyright © STAFFusion Inc. Flexible. Vetted. Staffing. FAST! All rights reserved.